Big 1/3-Off Keneally Sale ends next Tuesday! Summer One-Third Off Keneally Sale On NOW! That 1/3-Off Keneally Sale is BAAAACK! 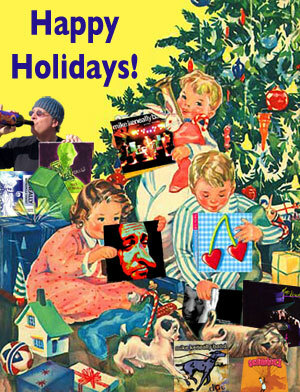 I am sending you, like, 18 sincere wishes for a wildly happy holiday season! A HOLIDAY SALE TO BRIGHTEN YOUR HEAD! 2018 draws inexorably to a close and Exowax marks it by offering you 20% off any purchase of $18 or more. Simply freakin’ use the promo code “2018” upon checkout to get your rightful discount. Sale is in effect until the end of the year. Thank you, for you’re kind! X-JAMM! 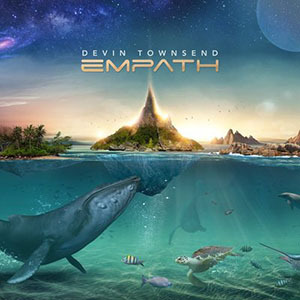 Featuring Mike Keneally & Beer For Dolphins, Devin Townsend, Travis Larson Band, OHM, Larry Mitchell, and a show-ending jam featuring Robert Martin, Andy Timmons, Andy West, Per Nilsson, Jen Majura, Kyle Hughes and more! The venue, M3 Live Theater at 2232 South Harbor Blvd in Anaheim, is a 10-15 minute walk from the convention center where the NAMM convention is happening, but check it out: NAMM credentials are not requred to attend X-Jamm! Civilians of all stripes are warmly welcomed! This will be the five-piece version of BFD and we will envelop you in a warm bath of tones and ideas before slapping you upside the head with provocative timbres and rude but wonderful gloriosity. Doors open at 5:30pm, and the first act hits at 6:20pm. There is food for purchase and a full bar, so no need to stop for dinner on the way over. Tickets are seated. It’s a really nice venue. Be a part of this! Here is the ticket link. 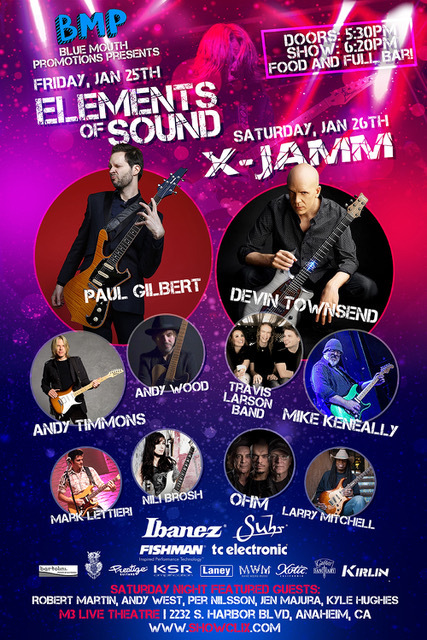 (Also, the night before on Jan. 25, Blue Mouth presents ELEMENTS OF SOUND with Paul Gilbert, Andy Timmons, Andy Wood, Mark Lettieri and Nili Brosh. Another remarkable night of music and madness and mirth and mmmmore! Here’s the dang link for that. The Joe Satriani What Happens Next tour ended a few nights ago in Pune, India (see the video I shot from the stage during that gig here). 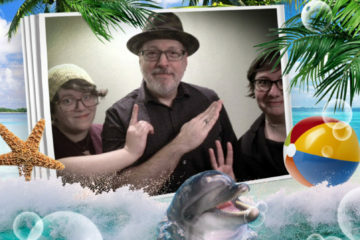 Man, what a fun tour. Just want to thank Joe, Bryan, Joe T, the crew and everyone who came to a show. I feel immensely grateful to be part of this team and look forward to playing with the dudes again at The G4 Experience in Palm Springs, at Hotel Zoso (Led Zeppelin reference?) January 3-7, 2019. In addition to playing with Satriani, I’ll be joining Beller and Travers in backing up Neal Schon, Rick Nielsen, Carlos Alomar, Bumblefoot, Lari Basilio and Kiko Loureiro. Serious fun. I think slots are still available? Check here to see. We start rehearsals for The Bizarre World of Frank Zappa in March. We’ll start announcing dates very soon. I’ll say a lot more about it later, but basically, take whatever your expectations about what a Zappa hologram tour might be, and abandon them, because this is going to be an experience unlike anything that’s happened to you before. From a musical standpoint, I’m delighted to be joining Joe Travers, Scott Thunes, Ray White, Robert Martin and Ed Mann in bringing Frank’s amazing music to you (some of which has never been heard before), and from a visual standpoint, we are going to present something you simply won’t see coming. Not gonna say more than that for now, but prepare to be truly affected by this experience. All right! I love you! Thank you for reading! HAPPY HOLIDAYS! Now I’d like to tell you what this month of October has to offer, for those of you in the vicinity of LA. If you’re not in the vicinity of LA, you still have time to get there. This is a brand new room for us, and we’ll be playing for a lot of new people, more of a Dead/jam-type scene than we normally play for, and I’m very excited about lattice-working our energy into this particular vibe. Like, REALLY excited. This will be the quintet BFD with Beller, Travers, Musallam and Peters and we will be playing one long set starting at 11:05. Zolomon starts at 8:25, with Disreputable Few at 9:45. An entirely fantastic way for you to kick off your weekend – join us all, please! Tickets are rampantly available here. So, Justin at the Potato offered us this night, and Beller is unavailable to do the gig, working hard on his upcoming solo opus. 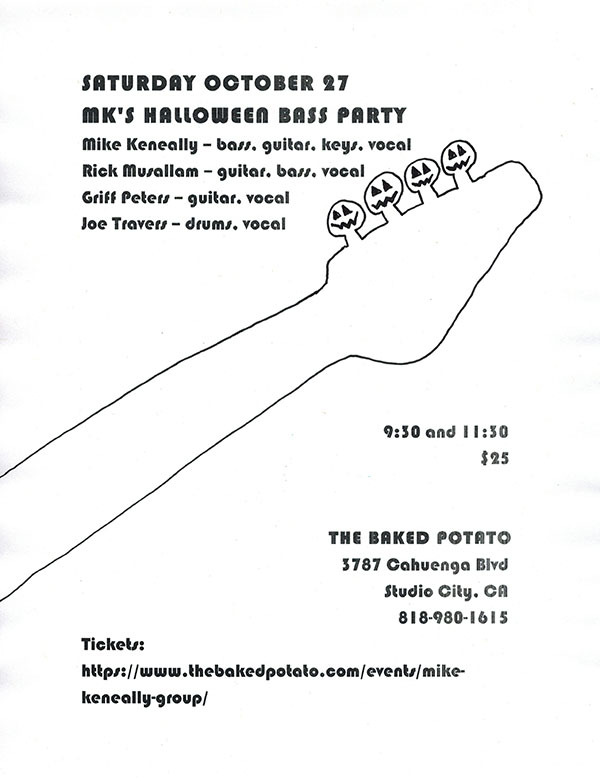 After thinking on it a bit I decided I definitely wanted to play at the Potato on the Saturday before Halloween – it should be nuts – but there wasn’t time to work another bassist in on a full night of material. I then came to a bold realization: I really wanted to play bass for this gig. I love playing bass and hardly ever do so publicly. 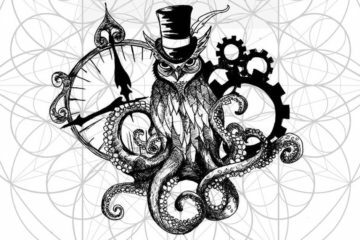 So I will toughen up my low-end chops and we (me, Travers, Musallam and Peters) shall present a selection of my tunes with basslines I particularly enjoy – some of which I originally tracked in the studio – but never get to play live. 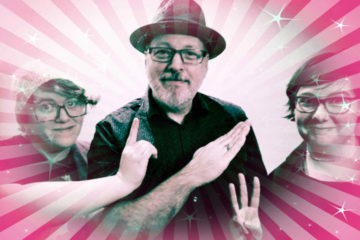 Rick will take over the bass for some tunes so I can be excessive on guitar and keys as well. In addition to my “bassist costume” for the night we will also deliver some Halloween-specific cover song action. No “Monster Mash” I promise. But SOMETHING relevant to the weekend’s needs. Two sets, as per Spud norm. You want tickets? In no way do I blame you! Procure them here. 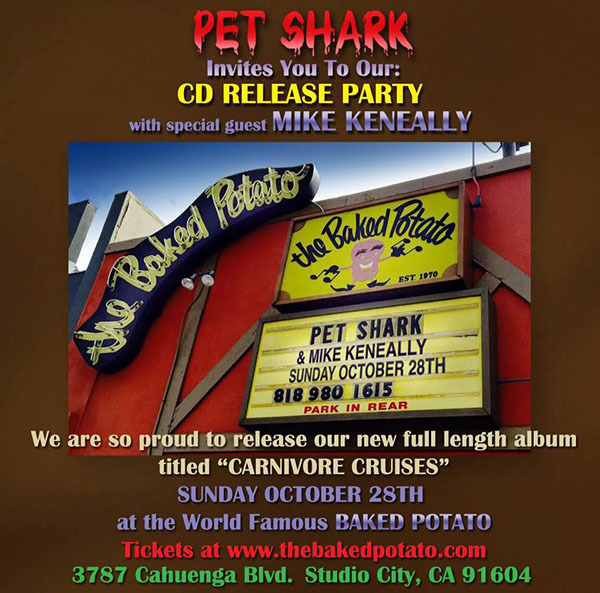 I co-produced the upcoming Pet Shark album, a brilliant slab of searing instrumental rock (with one really epic vocal tune), and the night after I have my bass fun on Saturday, I’ll be guesting with Pet Shark at their album release party playing tunes from the album. I’ll be on keys and 2nd guitar. If you’re not familiar with the Shark, now’s the time – definitely come on out and be prepared for some friendly face-melting. There can be no doubt that the tickets for these two sets are available here! The touring for What Happens Next is not over yet, Satch heads! In fact, THIS is what happens next: gigs in Australia, New Zealand and India late this year. I’ve never been to India! I’m (as I rarely say without irony because it’s not normally how I conduct myself linguistically but it’s actually completely true) stoked! Six dates in Australia, Nov. 24-Dec. 2. A gig in Auckland, NZ on Dec. 4. Then over to Pune, India for The Happiest Music Festival (how can anyone resist attending with a name like that?) Dec. 7-9. You want some ticket links? Feast on these! 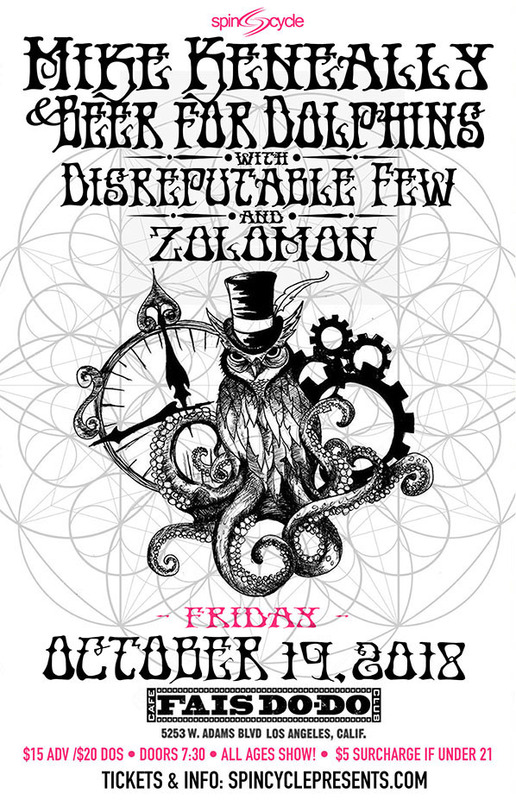 Between The Bizarre World of Frank Zappa tour, more Satriani dates, Devin stuff, and other things currently in the offing but still under concealment, 2019 is shaping up to be nuts. My gratitude for continued being-busy-ness is immense and I have great love for all people and circumstances which allow me to continue playing music for folks. Hooray!